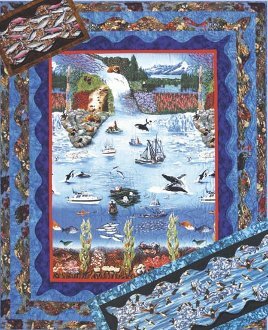 The wave borders on this quilt are the perfect way to feature ocean themed fabric. The waves are three- dimensional, and easy to make. This pattern is suitable for quilters with basic skills (just beyond beginner). The lap quilt is 48” x 60”, the table runner is 18” x 43” and the placemat is 12” x 18”.